Ka Manu 'O'o, educational art about extinct species in Hawai'i. This art features the beautiful Hawai'i 'O'o and was created for Conservation Council for Hawai'i, for an educational poster distributed to all schools in Hawai'i. 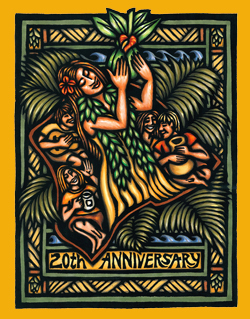 Kona Brewers Festival - 20th Anniversary Celebration and Benefit! The Kona Brewers Festival is a community fundraising event made possible by the Bill Healy Foundation that promotes the craft brewery revolution in Hawaii and encourages professional brewers and chefs to work together. The event raises funds for environmental, educational and cultural organizations. Japanese Public Television, NHK-BS: Jun Hasegawa Hula Lessons" and "Deep Hula". Ten episode special series on hula in Hawai’i, starring Jun Hasegawa. 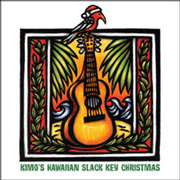 Featuring original art by Caren Loebel-Fried depicting the legends of the hula. Jun interviews Caren about her art and work in her Volcano home and at Volcano Art Center in Hawai’i Volcanoes National Park. Hawai'i State Library Centennial Mural - on view at the Hawai'i State Library, Honolulu, HI. 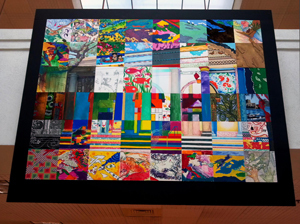 This unique mural features 48 colorful art pieces combined in a variety of media and styles representing the collective work of local and national artists, Library staff and children of Hawaii in commemoration of the Centennial Anniversary. A yearly festival at various locations supporting food sustainability in Hawai'i. Hawai'i Homegrown Food Network describes itself as a group "Envisioning an abundant and self-sufficient community-based food system for Hawai'i that promotes health and well-being and is grounded in indigenous wisdom, socio-economic justice, and sustainable agricultural practices." Ninety-seven printmakers of all experience levels produced 118 prints; woodcut, linocut, monotype, etching, lithograph, silkscreen, or any combination. The end result is a periodic table of elements intended to promote both science and the arts. 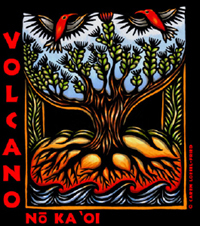 Logo art for Volcano Art Center, Hawai'i Volcanoes National Park. A wonderful art gallery atop Kilauea Volcano. 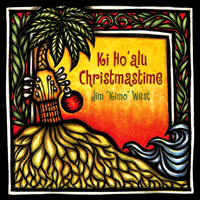 Art for Jim Kimo West's slack key guitar Christmas albums 2008 and 2013. Small batch designer truffles made in Hawai'i with only the finest European dark chocolate and fresh fruits like blueberries, raspberries, lychee, lilikoi and mango, or liquor fillings like margarita, mojito, cosmos, mai tai, and more. In his book, Positive Spirituality, Dr. Frederic Craigie proposes that excellent spiritual care arises from three arenas; the personal groundedness and spiritual well-being of clinicians, the clinical encouragement of patients' spiritual resources, and the organizational cultivation of spirited leadership and "soul." Read more about his groundbreaking book here. 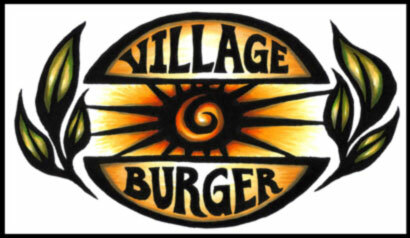 Logo art for Village Burger Kamuela. All natural hamburgers using locally grown ingredients. Logo art for Brushwood Nursery. 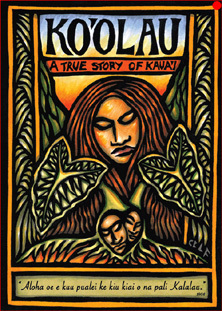 Art for Ko'olau, puppet performance based on a true story from Hawai'i. 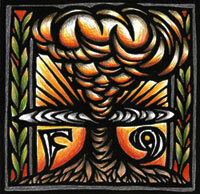 Logo art for Volcano Garden Arts. Logo art for Café Ono, tea and sandwich eatery at Volcano Garden Arts. 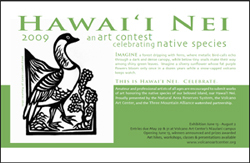 Art for logo, Hawai'i Nei, a yearly art contest sponsored by Hawai'i Island Natural Area Reserve System, Volcano Art Center, and Three Mountain Alliance, to promote awareness and preservation of native species. 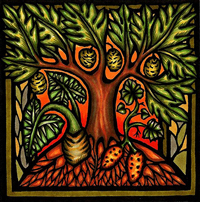 Logo art for Sommers Harvest, an organic family farm and CSA (Community Supported Agriculture farm) in Central New York State. A nonprofit organization that expands public access to visual art through a unique art donation and placement program. Click here to see other illustrations by Caren Loebel-Fried. Stockillustrationsource.com is the world’s largest collection of rights-managed illustration containing the highest quality of conceptual images available to the creative market.